Lewes were forced to settle for a draw despite taking the lead three times against local rivals Bognor in this competitive Sussex derby at the Pan, reports Tom Harper. Darren Freeman made several changes to the side that had drawn 0-0 at Molesey in the FA Cup preliminary round on Saturday, selecting the same team that won at Dorking in Lewes’ previous league game. Bognor were unbeaten heading into the game and made a bright start, with Lewis Carey only able to parry a long-range Mason Walsh strike before making a fine double-save to deny Bradley Lethbridge on the rebound. Lewes made the most of this by taking the lead with their first real attack after nine minutes, as Chad Field could only turn a dangerous Luke Blewden cross from the right into his own net under pressure from Jonte Smith. The Rooks nearly doubled their lead minutes later through Ronnie Conlon, who hit the post from close range at the end of a quick counter-attack down the left. Bognor were looking dangerous going forward themselves though, an equalised after 19 minutes, as Harvey Whyte rolled the ball into an empty net after an initial close-range effort from Lethbridge came back off the post with Carey beaten. The visitors enjoyed a lot of possession throughout the remainder of the half, but were finding it difficult to turn this into clear-cut opportunities. Lewes were happy to soak up this pressure and play on the break, with Blewden, Conlon and Bouwe Bosma all drawing smart saves from Kieran Magee in the Bognor goal at the end of incisive counter-attacks. The Rooks took the lead for a second time four minutes before the break, as Magee misjudged an Omarr Lawson corner from the left, allowing Smith to head in off the post from close range, despite the best efforts of Calvin Davies on the line. Bognor rallied quickly and levelled the scores on the stroke of half-time, after the referee adjudged Carey to have fouled Jimmy Muitt in the area, despite there appearing to be minimal contact at most, as the two players looked to reach a long ball forward. Muitt dusted himself down and sent Carey the wrong way from the spot to make it 2-2 at half-time. The visitors saw plenty of the ball during the early stages of the second half, but were once again unable to test Carey in the Lewes goal for long periods. It was Lewes who should arguably have taken the lead just after the hour, but Smith could only put a low Conlon cross from the left wide. Lewes continued to look dangerous on the break though, and spectacularly took the lead for a third time after 71 minutes, as Smith latched onto a long ball forward from Frankie Chappell and sent a superb half-volley from the right-hand side of the area across Magee and into the far corner. The Rooks sensed a chance to seal all three points soon after, with Conlon seeing a goal-bound curling effort from inside the area headed behind by Tommy Block. Bognor were not to be denied a third equaliser however, as Lethbridge controlled a long ball forward on the left-hand side of the Lewes penalty area, held off Chappell and unleashed an unstoppable half-volley which flew across Carey and in off the far post to level the scores once again. Both sides seemed keen to push for a winner during the closing stages but were unable to create any chances of note, with both forced to settle for a point which was arguably just about a fair result on the balance of play. Post match Darren Freeman gave his view of events from the dugout. Or relive the action thanks to James Boyes excellent camera skills. 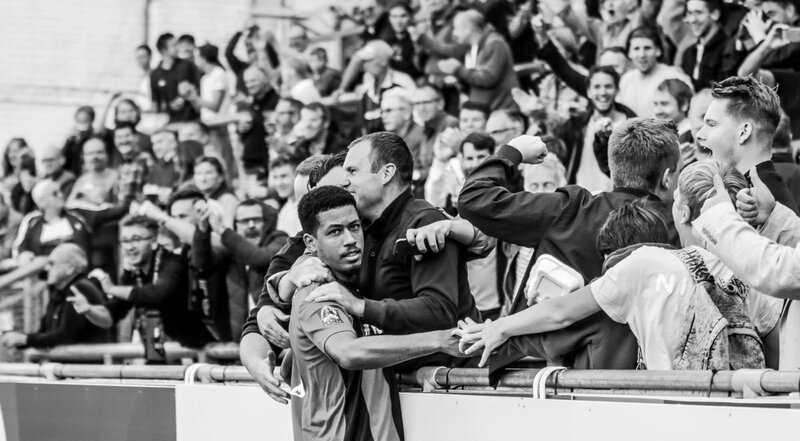 Next up for the Rooks is a trip to Margate on Saturday, kick-off at 3pm. Lewes: Carey, Lawson, Brinkhurst, Conlon, Chappell, Freeman, Dome-Bemwin, Blewden (Reed 72), Smith, Bosma, Conlon (N. Cotton 87). Unused Subs: L. Cotton, Medlock, Hammond. Bognor Regis Town: Magee, Davies, Edwards (Ridge 72), Tuck, Field, Heath (Scutt 46), Whyte, Block, Lethbridge, Muitt, Walsh (Sparks 62).